I made it! 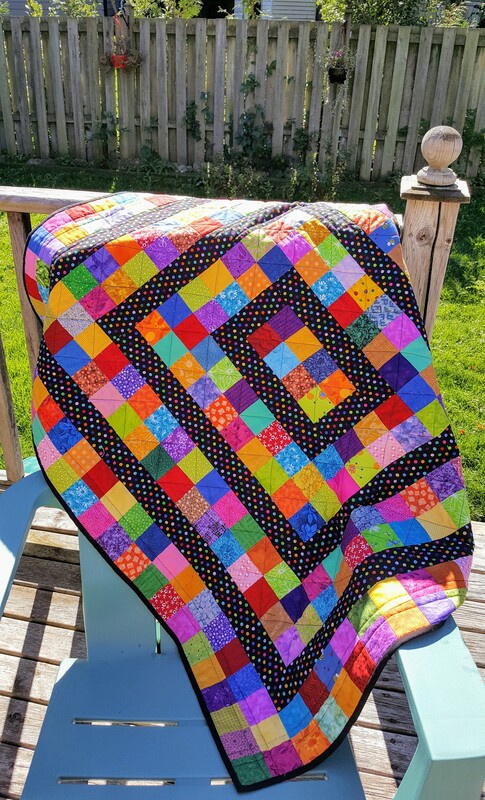 My Around the Block quilt was bound before the end of September. I’m so happy with how it came out. I’m so pleased with how this came out I’m keeping it. It’s the perfect size to cover my feet and legs when I”m stretched out on the the recliner chair. I finally have a finish. Believe it or not it’s my first one in 2018. 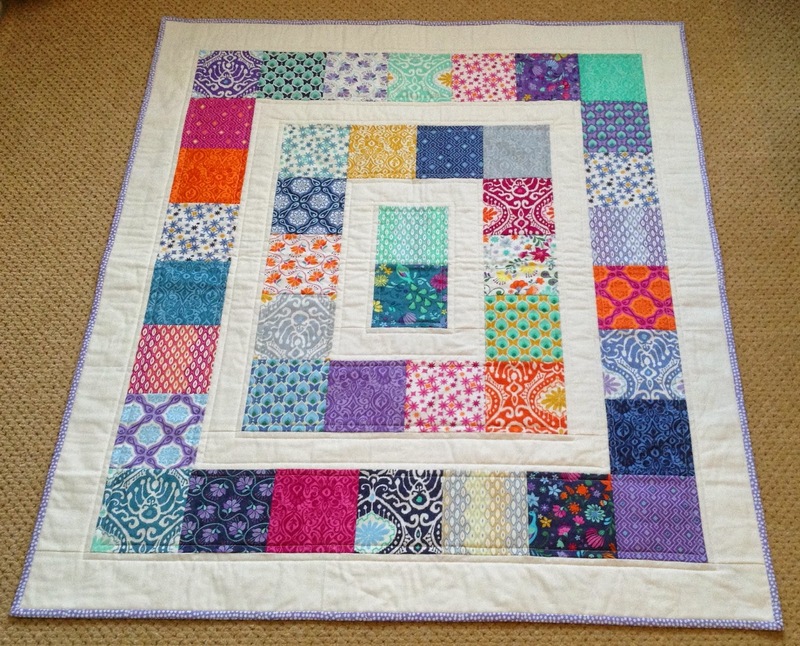 I started making these happy blocks earlier this year and actually finished a quilt with them in the same year I started working on them. I’ve made lots of tops in that time but never got them past the finish line. Life happened – renovations, family health issues, unpacking after renovations, setting up my sewing room after our move last year – and it kept me from the sewing machine more than I would have liked. And when I finally got to the sewing room I was piecing quilt blocks and tops and not sandwiching, quilting or applying binding to actually get quilts finished. That has now changed. 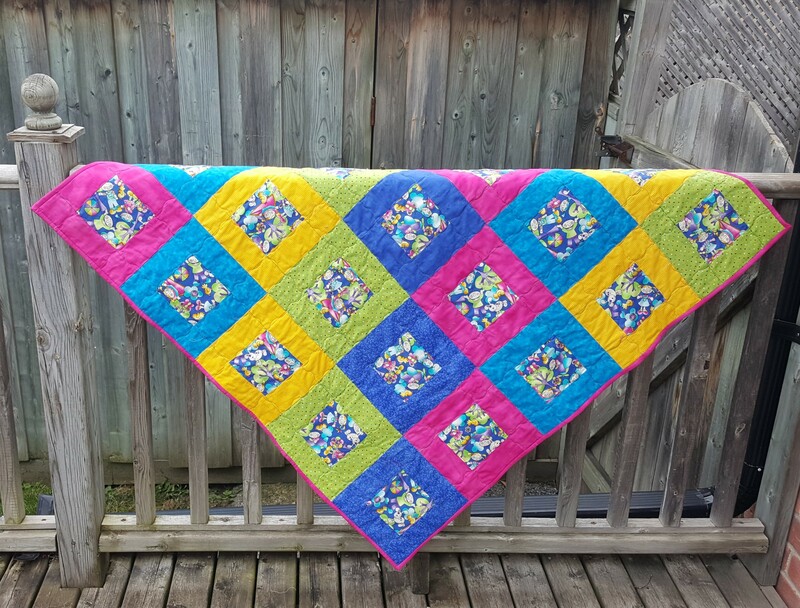 For this quilt I used the same print for the centre square and and then used various tone on tone fabrics from my stash for the outside of each block. I was planning to make it very scrappy but that didn’t happen. 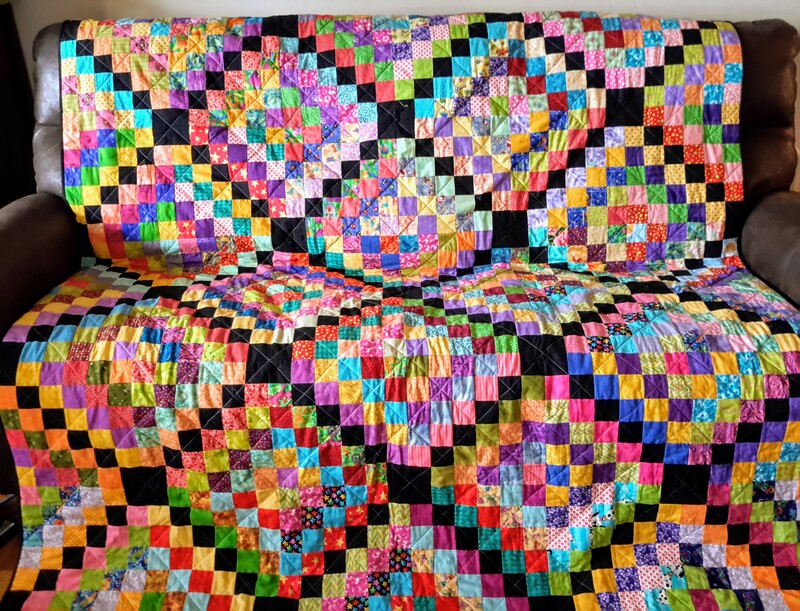 Rather a controlled scrappy quilt emerged. I found a green fabric with hearts on it in my stash. 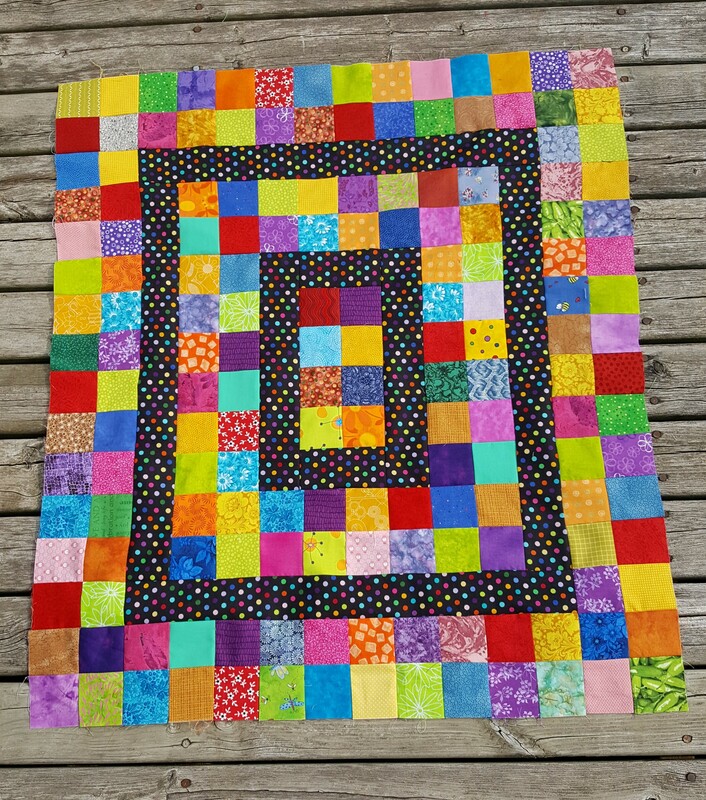 As it matched most of the colours in the quilt I thought it the perfect backing for this quit. I quilted it using a wavy line stitch on my sewing machine. It was then bound in the same material I used for the pink blocks. If you see some dark lines on the quilt those are marks from the crayola washable markers I used to mark some of the quilting lines on the quilt. I’ll wash it prior to giving it away. I’m not quite sure where this quilt will end up. I’m guessing that it may be donated to the quilt guild to use as a charity quilt or for the silent auction at the upcoming quilt show. When I mentioned to my beloved that I was blogging about this quilt. 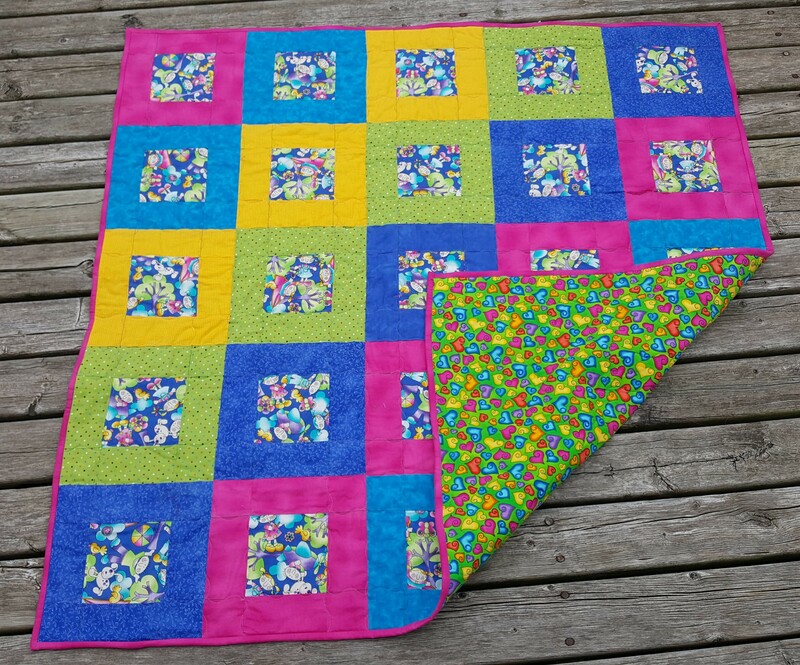 I described it as a the quilt I made with the colourful squares. He looked a me as if my head was spinning and exclaimed “Which quilt with the colourful squares?” and then started laughing loudy. Between laughs he suggested that given how I love bright colours, that my describing a quilt that way is not identifying in the least. I have to admit he does have a point; I do like colour! 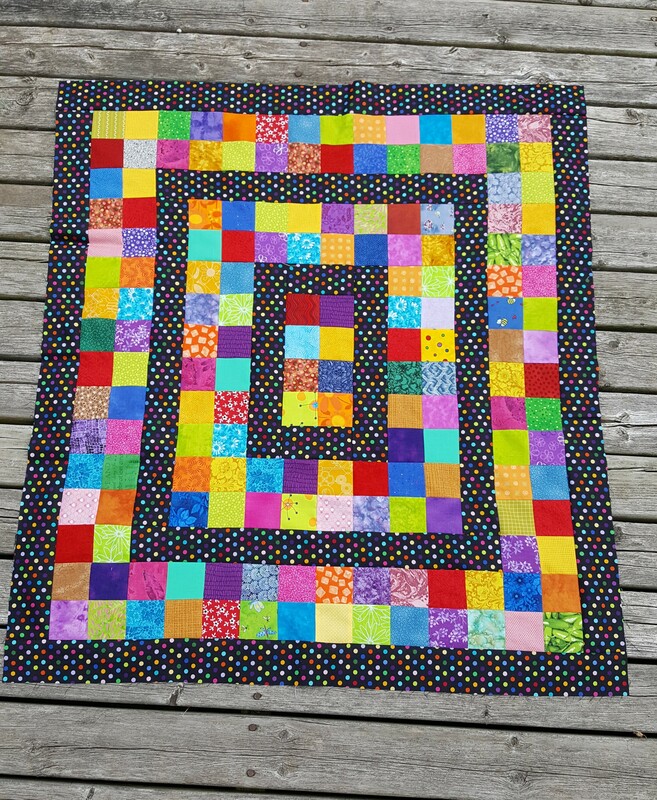 Instead I’m calling this my Happy Blocks Quilt. It probably won’t help him identify it but I’ll know which one it is. I’m so pleased. This past weekend I got in some serious quilting time. I got 5 baby/crib sized quilts FINALLY quilted. I love piecing, but sadly the actual quilting isn’t my favourite part of the entire process. I must confess that the quilting is very simple. I used the walking foot on my Husqvarna Sapphire and a stitch that produced a gentle curvy line. It went very smoothly and quickly. I think it complements the straight lines in the block nicely and adds a bit of interest. Yes, those light blue lines are marks from a crayola washable fine line marker. I’ve found that they are indeed true to their word and that the marker does wash out. I hope I’m not proved to be wrong on this though I’ve used those markers many times and have never known them to remain after the quilt has been washed. I found this quilt on the Patch the Giraffe blog. The blog hasn’t been that active lately but the pattern is still a great one. I’ve selected the blue material in the centre of the quilt for the binding fabric. It’s cut out and ready to go on. My plan is that the binding is on by the end of the week. 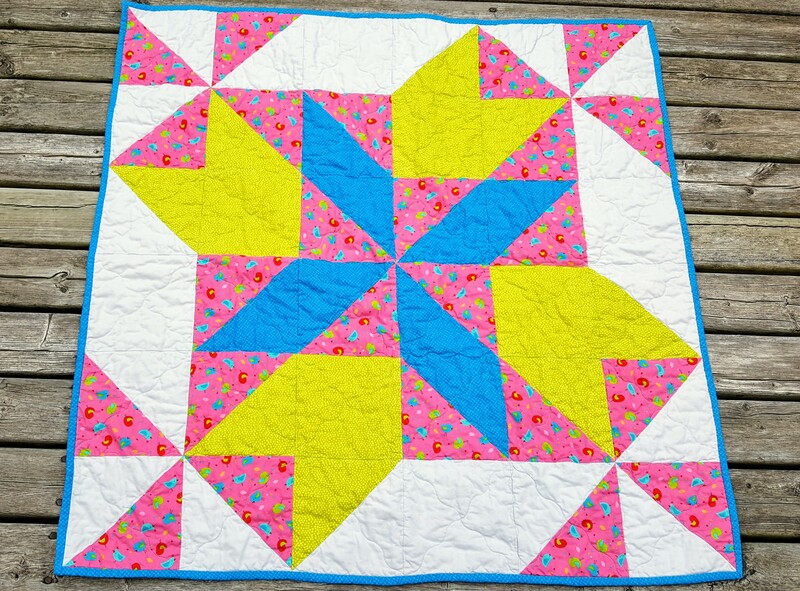 I’m linking this post up with many of the blog parties listed on my Quilt Parties page. My in-laws were over for the weekend, so the fabric that lives in the guest room had to move into my small sewing room for their visit. What can I say, other than my stash overflows the space available. The fabric is now moved back into the guest room and I have room again to sew in my sewing room. As I’ve got an embarrassingly large pile of unfinished quilts I decided that I should stop creating quilt tops and switch to actually quilting and finishing some of them. So, I’ve pulled out two quilt tops to be sandwiched and then quilted. The first quilt top, is the Hundred Hugs quilt and the second is the Cross my Heart quilt both from the Wedding Dress Blue Blog by Deanna. She has great designs and writes clear and straightforward tutorials. 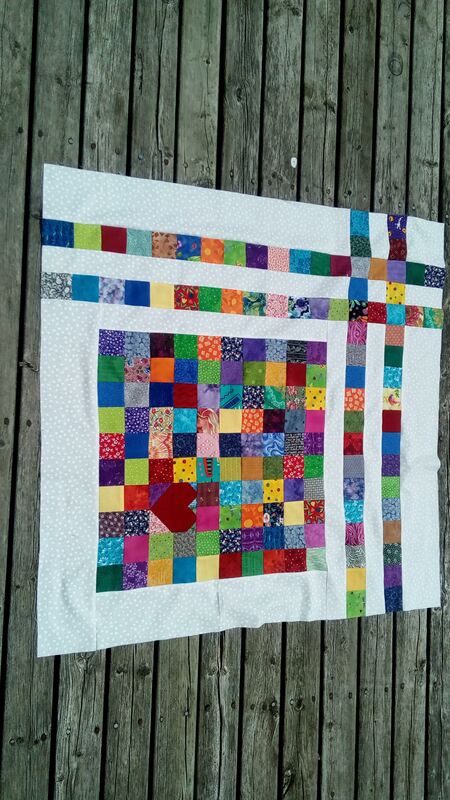 The Hundred Hugs quilt top was made a few years ago and has sat in the UFO pile far too long. 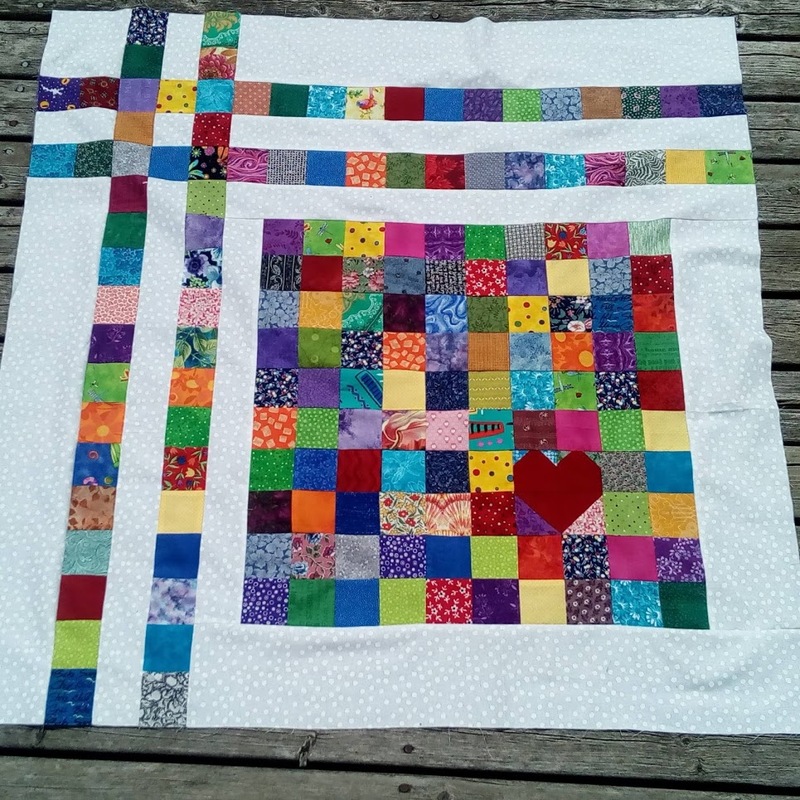 The Cross my Heart quilt is a recent finish that I’m trying to keep out of the UFO pile. So far, I’ve out cut batting for these quilts and selected backing. I hope to get one sandwiched, basted and ready to be machine quilted by the end of the evening. Wish me luck and no distractions! A few weeks ago I decided, on a whim. 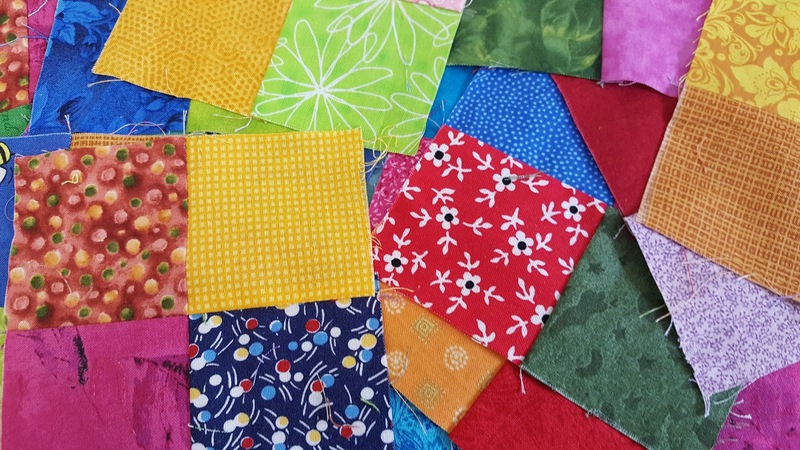 to sew together some 2.5″ squares, with the only criteria being “brighter is better”. I didn’t have a plan but that didn’t stop me. 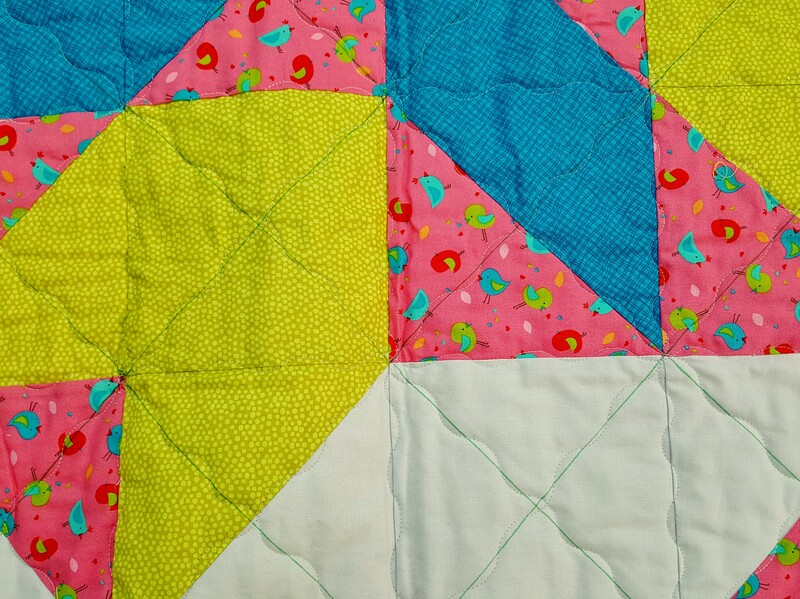 The 2.5″ squares soon became two-patches and then four-patch blocks were created. I just love sewing four-patches together. It’s easy, calming and best of all they go together so fast. I just kept making these four-patches until a pile accumulated. Finally I realized that I needed to find a pattern they work with or I’d have a random pile of four-patches to deal with later. When inspiration didn’t appear out of thin air I decided to started searching the web for ideas. I knew I wanted something fairly straightforward, preferably crib or lap sized and different to what I had made before. Other then that I didn’t have a clue what I wanted to do. 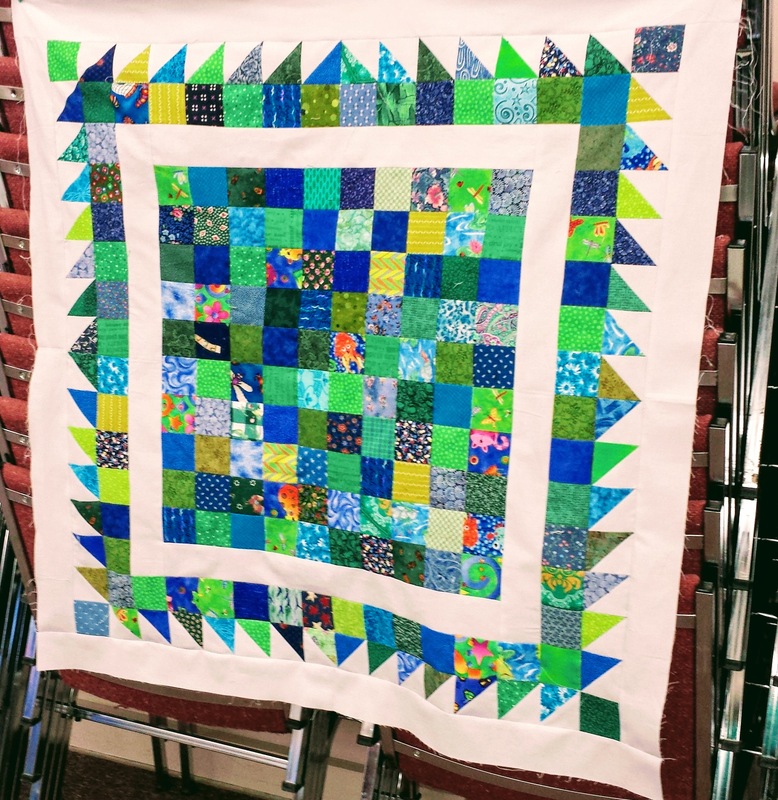 After some searching through Pinterest, Google images and blogs, I found this great quilt by Sarah at the Sew Me Blog This quilt, the Charm Pack Quilt gave me the inspiration I needed. I decided that I could use the four-patches that I’d made where Sarah’s quilt used the charm squares. I knew I’d need some math to adjust the size of the strips between the strips to take into account the difference between the size of the four-patches and the charm squares. I also knew I might need to add another “round” to the quilt to make it a good width for a baby quilt. It all seemed quite doable. It didn’t start off too well. I wasn’t thrilled with how the quilt looked as I started the project. It didn’t look scrappy enough or it was too scrappy – I couldn’t decide. Also, I wasn’t happy with my implementation of random and I questioned if the black polka dot material I had selected in place of the white strips was too busy. The only thing working well at the beginning was my math. However, I kept going and I started liking it more. The black polka dotted fabric looked much better once I added the next row(s) and the randomness of the four-patches was worked better the more I sewed. I’m really happy with how this turned out and I’m glad I decided to adapt Sarah’s charm pack quilt to work with my four-patches. I’m also glad I kept sewing after early doubt about my choice of fabric. I’m calling this my Around the Block quilt. I haven’t decided on the quilting or the backing yet but I’ve decided that I’ll bind it with the black polka dotted material that I used for the strips. Now to start searching the stash for a backing. it would be nice if I didn’t have to buy one. And of course I’ve got a small pile of four-patches left. 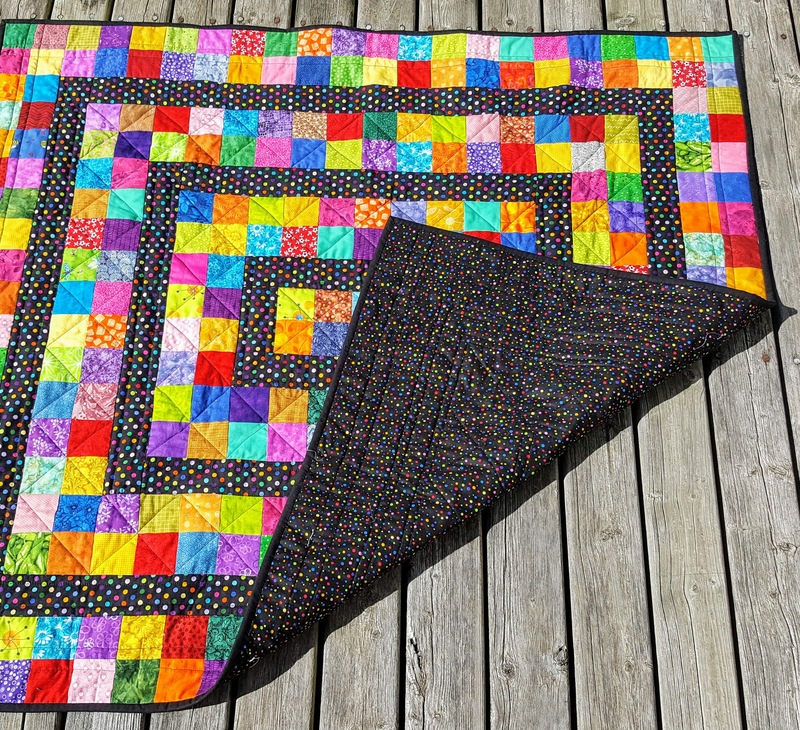 While most of my quilting features bright colours, I’m a sucker for black and white prints. Not grey prints but rather prints that are just black and white. 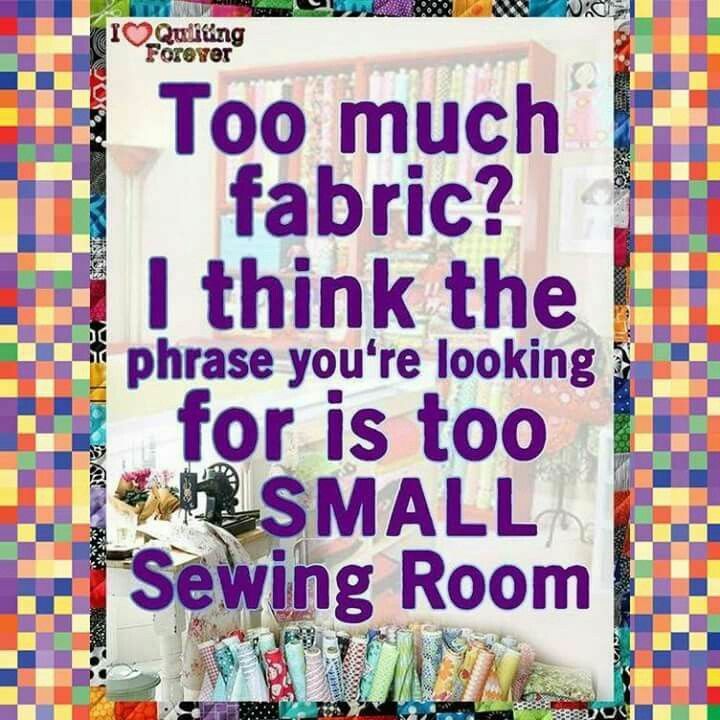 I’ve long been collecting them; to the point where I absolutely had to make something from them or I’d have to admit my hobby is buying fabric and not actually quilting. So I made this quilt top with some of the fabrics I had accumulated as well as scraps from other projects. 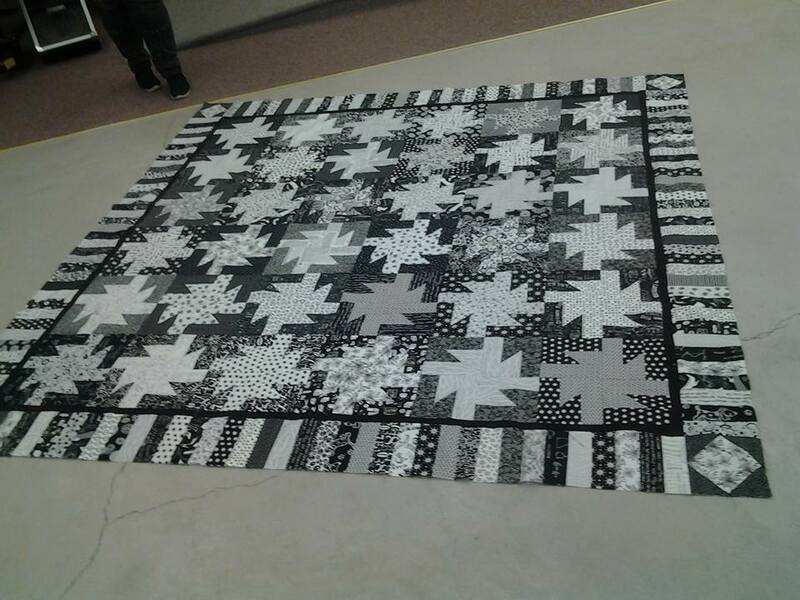 I just love how, despite being all black and white, this quilt is not boring. There is such a variety of prints to delight the eye. Unfortunately, I can’t find the magazine where I found this pattern or I’d cite it here. 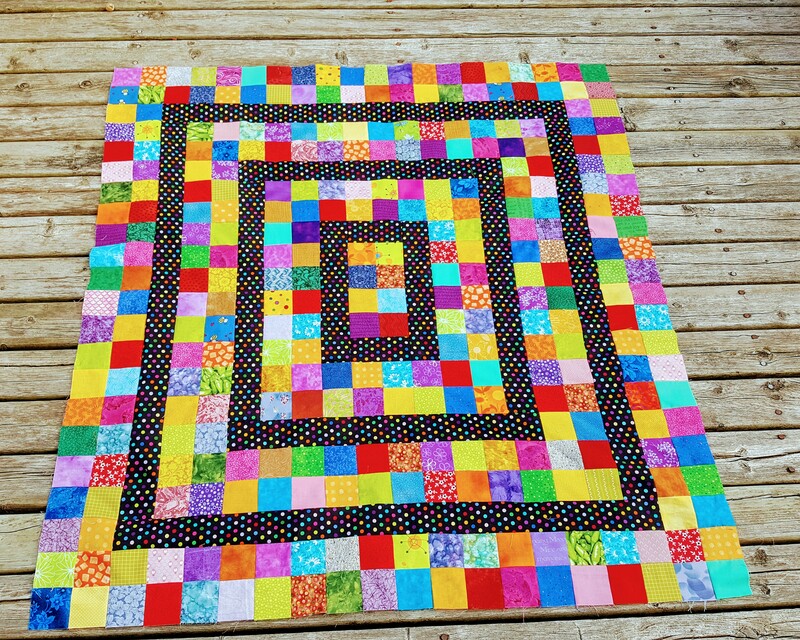 It’s a very simple pattern that uses 2.5″ strips and sews up very fast for a queen sized quilt. The blocks are 12″. The only change I made to the pattern, was the cornerstones where I used a square in square blocks rather than extending the piano key border. I can’t wait to quilt it and get it on my bed. Both the guilds I’m associated with are having Quilt shows within the next year and I wanted to make something for their respective Quilt Boutiques to help the guilds raise money. 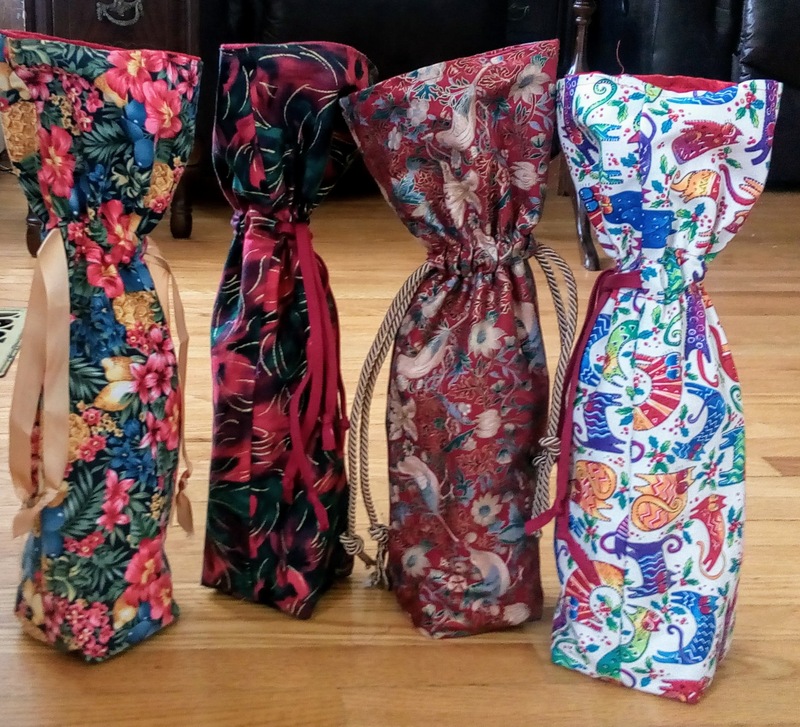 I decided I’d make wine bags – who doesn’t love a bottle of wine as a gift? I used this tutorial from Craftsy to make the bags. The tutorial was clear and the instructions were good. There was one part that I did change and that was the step for boxing the corners. Instead of measuring up 1.5″ from the corners, sewing a line and snipping off the excess fabric, I changed how I cut the pattern pieces. I cut a piece out of each of the bottom corners of the bag pieces measuring 1.5″ square. I didn’t take pictures but the method I used is illustrated as the second method in this tutorial at the Sew For Home website. I found this method went faster than the “measuring up and sewing across” method and I found the the seams at the bottom of the wine bags were more precise. I made well over 3o bags but I didn’t take pictures of each one. Here are a few I made. 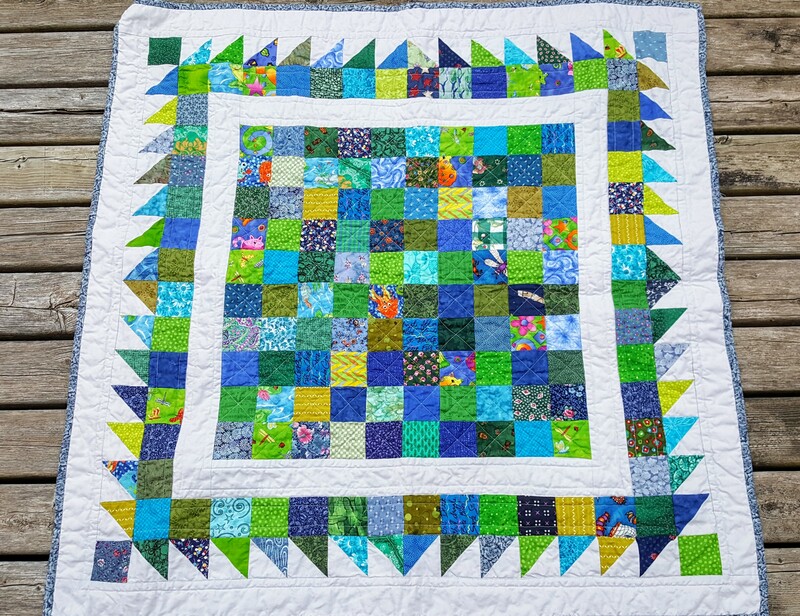 This quilt, from Bonnie Hunter’s blog, is called Scrappy Trips Around the World. You can link to the pattern here. It was given to my step daughter as present to mark her graduation from a university honours program. It’s a super easy pattern and very fun to make. Many of my colourful and bright 2.5″ strips got used up in making this (though I’m not sure how much of a dent I made in the pile!). I made it with scraps I’d cut from fat quarters and width of fabric cuts of yardage as I’m not one to buy jelly rolls or other coordinated fabric lines. While the pattern calls for all blocks to be scrappy, I needed somewhere for the eyes to rest, given how vibrant the colours are. Therefore I made the centre diagonal row in each block with a solid black fabric. 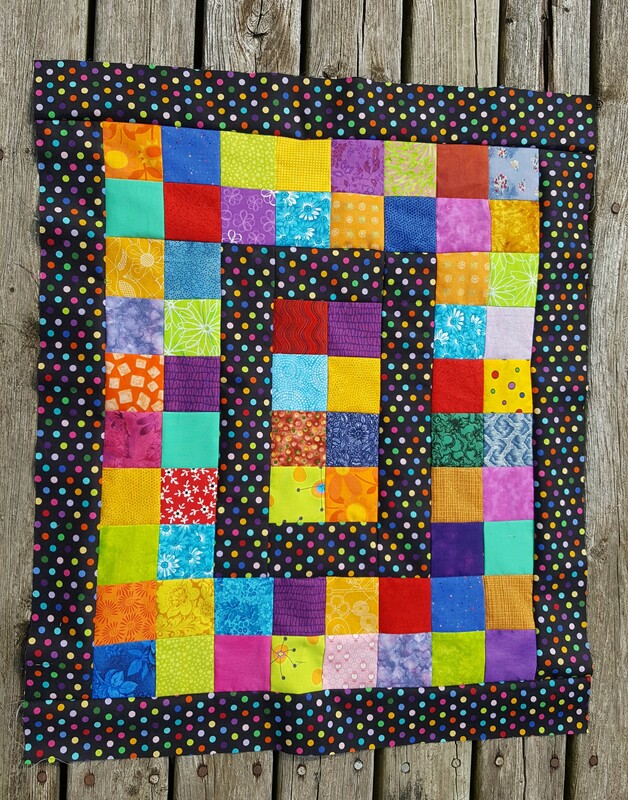 I like how it gives some cohesion to a very scrappy quilt and how the colours all seem to work together with the black row anchoring each block. This quilt involved some new math on my part. It was made with twelve inch blocks, six wide and eight down. 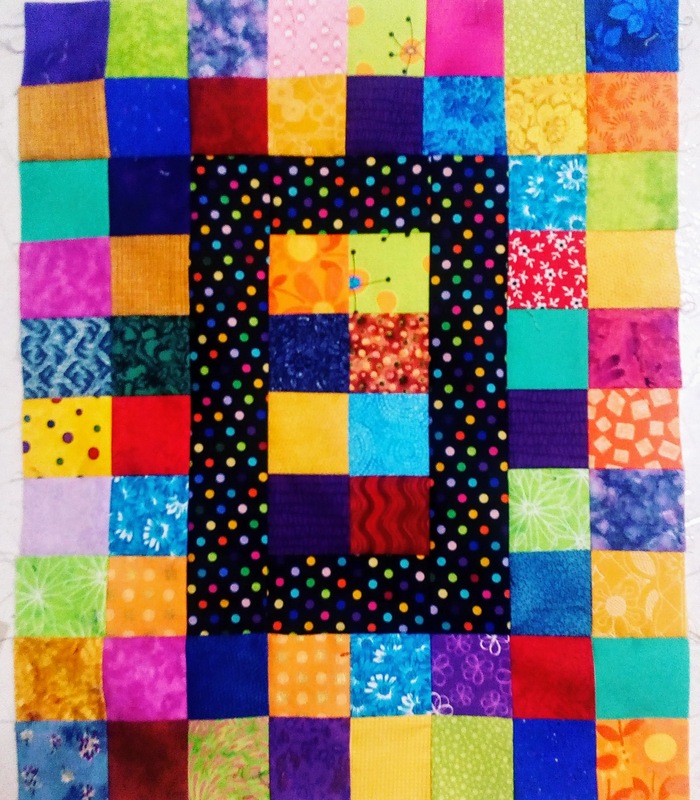 For some inexplicable reason I had decided that would make the quilt 72″ x 84″. I only realized after the fact that my math skills had failed me and 8 x 12 is actually 96″ and not 84″. No wonder it took so long to quilt! I did the simple cross hatch quilting on my home sewing machine. My arms, shoulders and upper back definitely got a work out! 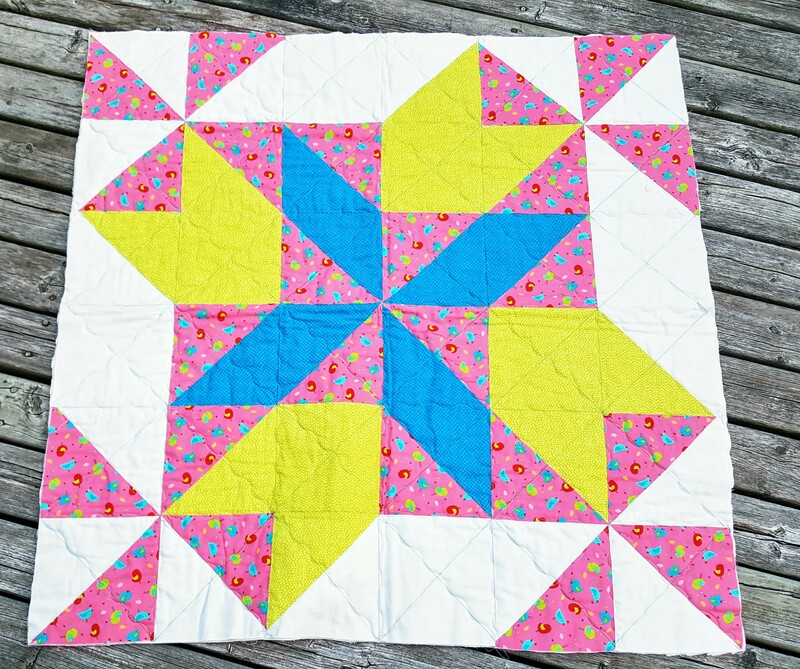 I’d make this again – however, I’d check my math before assembling the quilt.